Wildlife Educational Ambassadors are non-releasable wild animals that help advance the cause of wildlife education and conservation by their numerous appearances throughout the community at schools, private and public events. To be able to see them up close is an unforgettable experience. For a nominal fee, you may schedule a presentation with the Ambassadors and their handlers. You can help our ambassadors spread the word about wildlife conservation by making a tax deductible donation to Wildlife Rehabilitation & Release. Please be aware that keeping wild animals in captivity requires permits from both U.S. Fish & Wildlife and California Department of Fish & Wildlife. It is illegal to possess a wild animal unless you are a permitted wildlife rehabilitator/handler or falconer. Chester was found hanging on a barbed-wire fence in 2006 by a Yuba County Animal Control officer. It is presumed that he flew into the fence while hunting in a field and may have hung there for two days before being found. While thrashing around to escape, he severely damaged his wing and scratched his right eye. A veterinarian tried to fix his elbow but, unfortunately, it didn’t heal well enough for him to fly silently so that he could hunt in the wild. Both Chester’s damaged wing and eye determined him to be non-releasable. Chester is very intelligent. Due to his calm and good-natured demeanor, he became an Education Ambassador. He is a very popular Ambassador who regularly visits many classrooms and attends many events in the area. 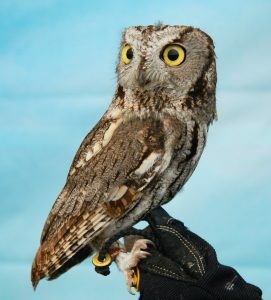 People are entranced by Kajika and often mistake him for a baby owl because he is so small. In the winter of 2011, a tiny nestling Barn Owl was found in a haybarn along with two dead siblings. What saved his life was landing in a fresh “cow pie.” The little owl was fondly named “Steamer.” Young Barn Owls typically have ravenous appetites. But Steamer’s fall caused injuries to his wing and abdomen so he had to be enticed to eat at first with little bits of mice. Infection in the wing required a course of antibiotics which secondarily caused some feather damage. Steamer looked a bit scraggly for a while until he grew into his juvenile plumage. An incredible amount of love and care went into helping Steamer grow into a normal and healthy Barn Owl. Unfortunately, Steamer’s difficult start in life resulted in a permanent wing injury and not-so-perfect feathers, making him non-releasable. For a Barn Owl, Steamer displayed a relatively calm personality, qualifying him to be a good candidate as an Education Ambassador. Steamer is now a handsome adult Barn Owl who will live a life of teaching many people about the value and beauty of his species. 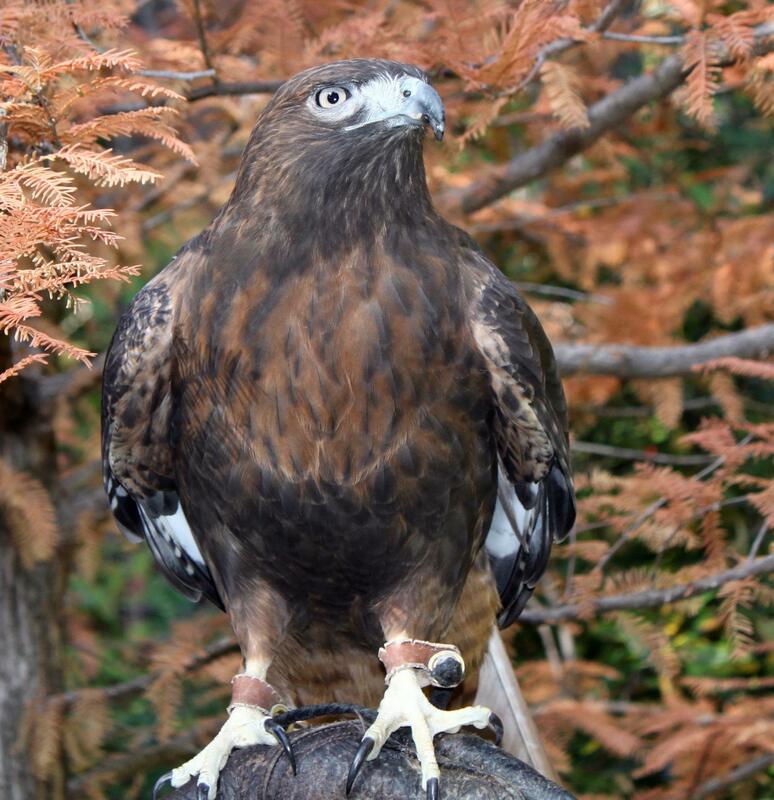 Skye, a “light morph” female Red-tailed Hawk, was transferred to WRR through the Ojai Raptor Center, just before Christmas, 2012. She was found in Camarillo, near the Pacific Coast Highway, close to an Air Force Base. She had been shot. The bullet shattered the radius in her wing and although the bone has healed, the wing cannot fully extend. Sadly, Skye will never be able to fly well enough to sustain herself in the wild. Winston came to WR&R in October, 2007, from Davis, CA via the Lindsay Wildlife Museum where he was deemed non-releasable due to his habituation to people. He had been found (or taken) by college students who intended for him to become a “pet”. They then abandoned him at the end of the school term. Lindsay Museum transferred Winston to Wildlife Rehabilitation and Release where he became a wildlife ambassador. Winston is friendly and social around people, especially women and young children. He seems to like being the center of attention at public events, often cawing loudly. All crows need intellectual stimulation. Something as simple as a shiny button will make Winston happy…..for a while. Crows have been observed sliding on their bellies down roofs in the snow. They are amazing animals!